Ocala police reported that a Rolex watch and wallet were stolen Tuesday (21 May 2013) from a locker at the YMCA. According to the report, the victim indicated that he secured his locker with his personal lock and key and was away for roughly 40 minutes. When he returned, he found the locker open and his Rolex Oyster watch, valued at $7,500 missing along with cash from his wallet. Although this story happened in Florida, ask any high school student about locker room security and you will find yourself very surprised. What high school students know that many Rolex wearers do not is that it is very easy to break into a locker. High school locker rooms, as well as locker rooms in gyms, are prime places for theft because people tend to keep to themselves, locker rooms have little physical security, and because of showers and people potentially being disrobed, there is no remote security. There are plenty of stories of stolen iPhones and now Rolex watches from school and gym locker rooms. It is very easy for a Rolex owner to be marked and followed into a locker room, the particular locker identified, a few minutes of waiting for the Rolex owner to leave, and 60 seconds later the watch is gone. A simple gander on YouTube will show anyone how to open a combination of key lock frequently used for locker room lockers. There is no real brute force, no hammers, or highly technical lock picking practice but rather simple things like a hairpin or soda can. This video shows how strikingly easy to open what appears to be a solid lock worthy of securing your Rolex. Many Rolex wearers ask on the Internet forums whether it is safe to do certain things wearing their Rolex ranging from golf to going to the gym. Opinions always vary on these types of questions but one thing is certain, typically the safest place for your Rolex is on your wrist. In places that have locker rooms such as gyms or spa’s, wear your watch. If you feel uncomfortable doing so, lock your watch in your car (so you won’t be marked walking into the gym) or lock it at home. 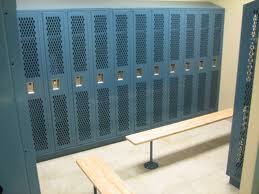 Even though gym locker rooms appear safe, just think of the 15 year old with a soda can. Opening lockers is easier than people think.